Virtual machine scale sets are an Azure Stack compute resource. You can use them to deploy and manage a set of identical virtual machines. With all virtual machines configured in the same way, scale sets do not require pre-provisioning of virtual machines. It's easier to build large-scale services that target big compute, big data, and containerized workloads. 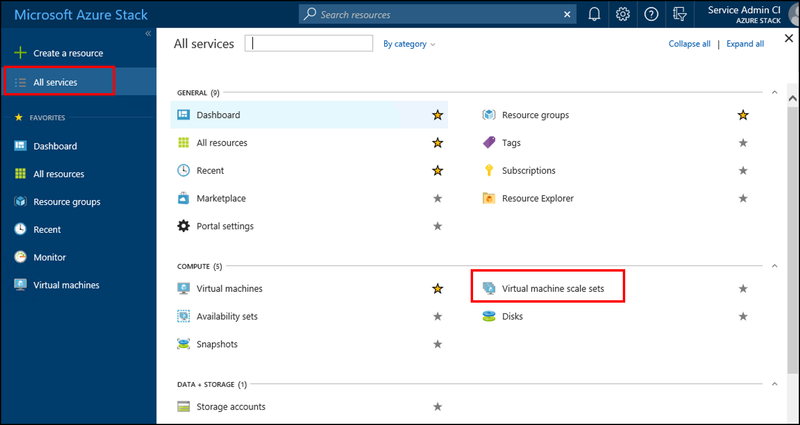 This article guides you through the process to make scale sets available in the Azure Stack Marketplace. After you complete this procedure, your users can add virtual machine scale sets to their subscriptions. 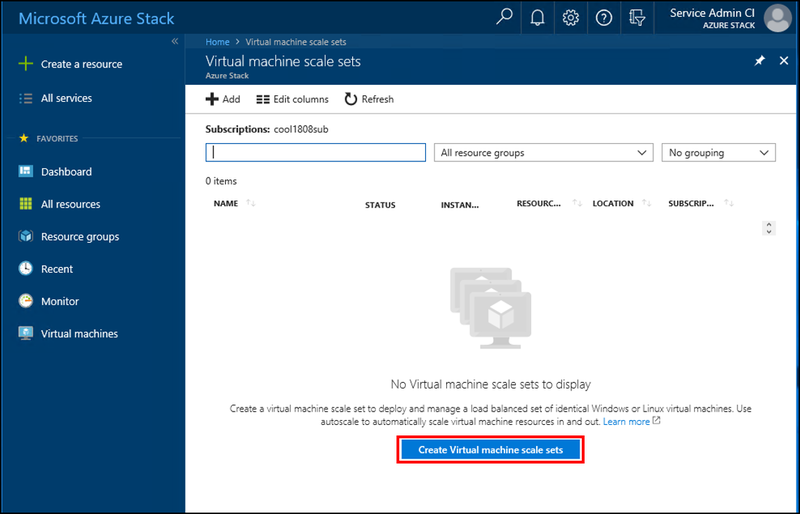 On Azure Stack, virtual machine scale sets do not support auto-scale. You can add more instances to a scale set using Resource Manager templates, CLI, or PowerShell. The Marketplace: Register Azure Stack with global Azure to enable the availability of items in the Marketplace. Follow the instructions in Register Azure Stack with Azure. 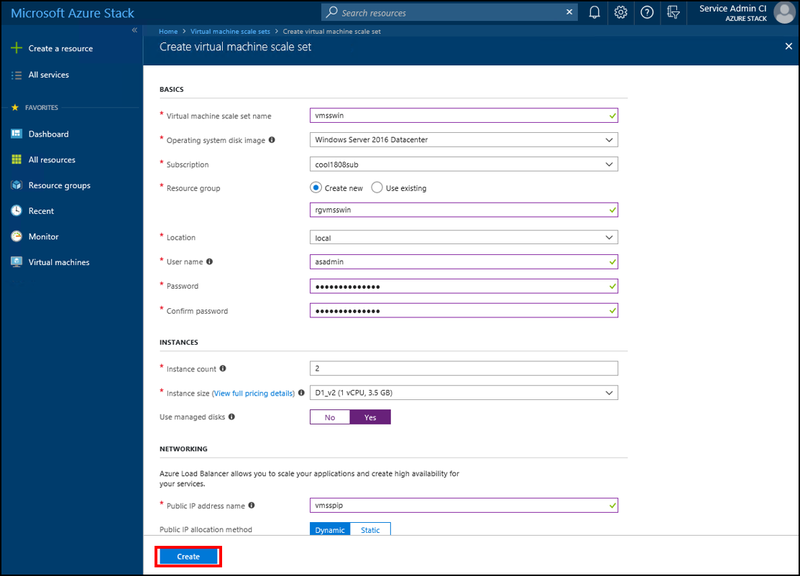 Operating system image: Before a virtual machine scale set (VMSS) can be created, you must download the VM images for use in the VMSS from the Azure Stack Marketplace. The images must already be present before a user can create a new VMSS. The information in this section applies when you use Azure Stack version 1808 or later. If your version is 1807 or earlier, see Add the Virtual Machine Scale Set (Prior to 1808). Sign in to the Azure Stack portal. Then, go to All services, then Virtual machine scale sets, and then under COMPUTE, select Virtual machine scale sets. Select Create Virtual machine scale sets. Fill in the empty fields, choose from the dropdowns for Operating system disk image, Subscription, and Instance size. Select Yes for Use managed disks. Then, click Create. To see your new virtual machine scale set, go to All resources, search for the virtual machine scale set name, and then select its name in the search. The information in this section applies when you use a version of Azure Stack prior to 1808. If you use version 1808 or later, see Use the Azure Stack portal. Open the Azure Stack Marketplace and connect to Azure. Select Marketplace management, then click + Add from Azure. 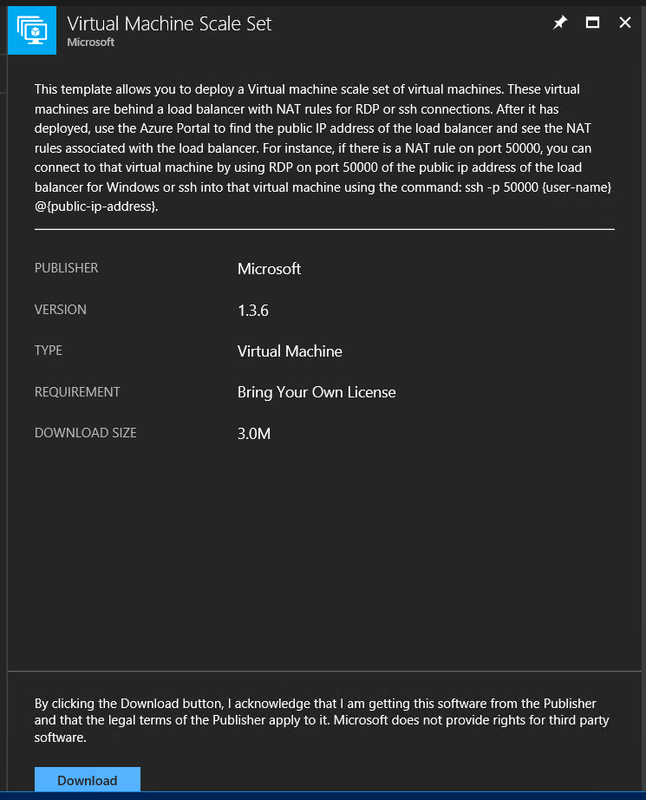 Add and download the Virtual Machine Scale Set marketplace item. When the version is set to latest in the imageReference section of the template for a scale set, scale up operations on the scale set use the newest available version of the image for the scale set instances. After a scale-up is complete, you can delete older virtual machine scale sets instances. The values for publisher, offer, and sku remain unchanged. When the image on the Marketplace is a newer version than the image in the scale set, download the new image that replaces the older image. After the image is replaced, a user can proceed to scale up. When the image version on the Marketplace is the same as the image in the scale set, delete the image that is in use in the scale set, and then download the new image. During the time between the removal of the original image and the download of the new image, you cannot scale up. This process is required to re-syndicate images that make use of the sparse file format, introduced with version 1803. If you download an image with a newer version (which changes the available version), the scale set cannot scale up. This is by design, as the image version specified in the scale set template must be available. For more information, see operating system disks and images. You can scale the size of a virtual machine scale set to make it larger or smaller. In the portal, select your scale set and then select Scaling. Use the slide-bar to set the new level of scaling for this virtual machine scale set, and then click Save. The gallery item might not be removed immediately. You might need to refresh the portal several times before the item shows as removed from the Marketplace.